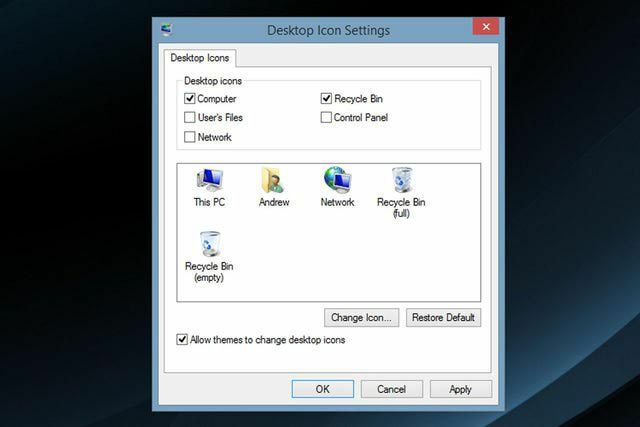 In Windows 7, you probably noticed that several icons are missing from the desktop, especially if you upgraded from an older version of Windows like Windows XP. One of the shortcuts you might miss in particular is for My Computer, which lets you quickly open Windows Explorer to see all of your system's hard drives and the folders where you find your files, programs, and other resources. Fortunately, the icon is not lost forever. In fact, it should take just 30 seconds or so to get it back on your desktop. Right-click the desktop and choose Personalize from the menu. When the Personalization Control Panel window appears, click the Change desktop icons link on the left to open the Desktop Icon Settings dialog box. Put a check in the box next to Computer. Several other options appear in the dialog box, and most are probably unchecked, meaning that they're also not displayed on the desktop. Check any of the other options you'd like to enable as well. Click the OK button to save the changes and close the dialog box. When you return to the Windows 7 desktop, you will find the My Computer icon back in its place. There is also a My Computer shortcut in the Windows 7 Start Menu. Adding the shortcut back onto the desktop won't change this; you'll just have two ways to access your files and folders. Why Did the My Computer Icon Disappear? Beginning with Windows XP, Microsoft added a link to My Computer in the Start Menu. As a result, users now had two shortcuts to access their files and folders via My Computer: one on the desktop and the other in the Start Menu. In an effort to declutter the desktop, Microsoft chose to remove the My Computer icon, beginning with Microsoft Windows Vista. Along with this change, Microsoft also dropped the "My" from My Computer, leaving it to be called simply "Computer."